La Roche nestles in the beautiful countryside of the southern Dordogne, between Bergerac and the tranquil medieval bastide of Eymet. The 1-acre garden contains a 12x6m private pool with diving depth. A further 9 acres belongs to the house, and there are fields beyond. The white stone farmhouse dates from about 1860 and has been sympathetically and tastefully restored to a luxury level, whilst retaining exposed beams and stonework and other traditional features. Downstairs: Entrance hall with view to upper level; Kitchen with hand-crafted limed oak units, hob, oven, microwave, fridge/freezer, dishwasher, washing machine and tumble dryer; Lounge; 3rd Bedroom; Toilet; Bathroom with corner bath & shower. Upstairs: Gallery overlooking hall; two Bedrooms with en suite bathrooms, second Lounge. Garden: Superb views over rolling countryside; Tables & chairs to front & rear of house; BBQ; table tennis; children’s swings. Travel: Flying: Flybe serve Bergerac (just 10 miles away) from various airports around the UK, including Southampton, Manchester, Exeter and Belfast. Ryanair serve Bergerac from Stansted. BA fly to Bordeaux and Toulouse. There are several car hire companies at Bergerac airport. Driving: The drive can be done in a day from Calais, Boulogne or the other ports, or you might have a more leisurely start to your holiday with an overnight stop, perhaps on the Loire - we can give you details of places we've stayed in, if you wish. With the recent construction of the A20, the journey is now very easy and virtually toll-free south of Orleans. We'll include full driving instructions with our booking confirmation letter. Climate: The area has a temperate climate, and usually enjoys relatively mild winters with long spring and autumn seasons. The summers here can be very hot - ideal for sun lovers. Should you wish to discuss your holiday requirements or travel arrangements, or find out more about the house, please send us a message via Home Away. We fell in love with France in the early 1990s, when work brought us to live there for a while. After moving back to the UK, we spent lots of holidays in France with our children ... and then in 2000 we found La Roche, and fell in love with that, too. Great for a peaceful family getaway. The property seems to improve each time we come out to stay - the latest addition being air conditioning - very useful for sleeping as it was very warm when we stayed! WiFi, TV and pool ensure the kids are happy. A well equipped kitchen makes preparing meals easy. Lovely area, with so much character and plenty to see and do. Or just lounge by the pool and enjoy the quiet...!! It was wonderful to visit La Roche again and to see the amazing new upstairs accommodation. It's all been beautifully done and was much appreciated. We've always loved La Roche; the pool is brilliant and we love the quiet and doing our rounds of the local markets! As ever, we hope to return! Many thanks for making such a lovely place available. Thanks for your lovely review - hopefully see you at La Roche again soon. The house is simply wonderful with everything you need to make your stay perfect. Situated within easy reach of many lovely villages around the Dordogne region, it made an ideal base. Our dog, Poppy just loved the large garden which she played in from the day we arrived to the day we left. We would definitely recommend this lovely house to anyone thinking of visiting this area of France. We stayed at La Roche for two weeks in July 2017 and had a fantastic time. 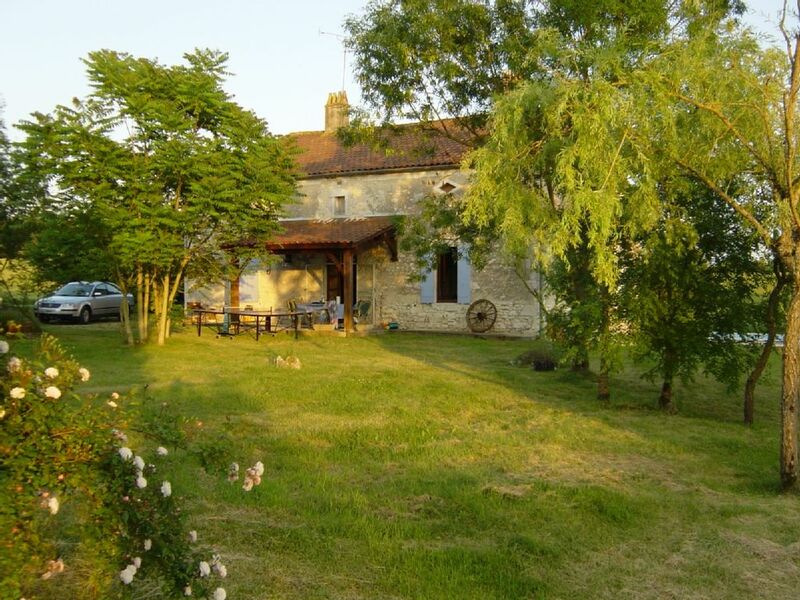 La Roche is a lovely old French stone farmhouse set in a rural, quiet location. It has been brought up to date in a sympathetic way as not to spoil the character of the building which we felt was very well done. The super king size beds and en suites were better than any hotel I have stayed in. The pool is a great size and keep in top condition by Jerry who calls twice a week between 9 and 10am. If you enjoy birds of prey La Roche is a great place to stay. I must mention the local Boulangere at Singleyrac it does fantastic cakes and bread which we really enjoyed. For eating out the old square at Eymet has plenty of restaurants in lovely surroundings. We had a great stay here for half term week. A really lovely property with everything you could ever need. The location is so quiet and very pretty with the rolling countryside all around. The house, grounds and pool are all perfect. Thank you. The house is very comfortable and well equipped. We had a really good time relaxing and using the lovely pool. It is secluded and peaceful but within reach of many pretty villages and towns. The house was well cleaned for our arrival and the new loft conversion is amazing. It's a great area for cycling too. Thank you very much, we hope to return one day. A thriving wine growing area, the landscape is striped with the vineyards of Bergerac, Pécharmant, Monbazillac and Saussignac, with St Emilion on the western borders of the region. 8km to the south is Eymet, with its medieval cobbled square. The region is famous for its gastronomic delights, particularly duck and foie gras.